Next at Arby's: Montreal steak sandwiches, bacon milkshakes?! Arby's is having a very big year. They reached a whole slew of N.E.R.D. fans when Pharrell wore their hat to the Grammys. The Meat Mountain climbed to power. They scored Ving Rhames for an ad campaign. And at a special presentation today, the roast beef barons hinted at plenty more exciting new stuff in the pipeline. After testing a massively popular gyro in September and bringing back the King's Hawaiian BBQ Brisket, Arby's has now set its sights on steak. This week, they'll debut a new Montreal Angus and Portobello Sandwich, starting at $5.49. 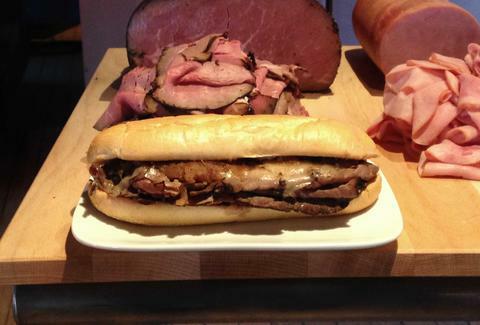 The sandwich features slices of steak, portobellos marinated in Montreal seasoning, caramelized onions, naturally-aged Swiss cheese, and garlic aioli nestled between a toasted sub roll. It joins its siblings Angus Philly and Angus Three Cheese & Bacon as the third steak selection currently at Arby's -- and in case you were wondering, it's freaking delicious. But as Arby's continues to blow out their new "We have the meats" campaign, they've also developed brand new meat options. That includes a turkey smoked like their beef brisket (except for 8-hours) and a fancy pit-smoked ham that's somewhere "between a country ham and Christmas ham", both of which should hit hoagies sometime soon. And that's just the official stuff. Some of the most fun revelations at the presentation were pure speculation, but it would be irresponsible of us not to report back on all the rumors. The Arby's execs mentioned that the most popular item ordered during their Halloween "trick or meat" promotion was the bacon milkshake, and that "you might see a bacon milkshake at Arby's" in the not-so-distant future. (Hold us.) Their executive chef Neville Craw also says they've debated a few times whether they're "ready for a banh mi or [if] that's a few years away", which means Banh Shop better not get comfortable. One last piece of good news: based on the response, Arby's is definitely planning to bring back the gyro sometime next year. That gives you and Ving Rhames at least two months to get the pronunciation down right, so start practicing now. Kristin Hunt is a Food/Drink staff writer for Thrillist, and is still starstruck from meeting Pharrell's hat. Follow her at @kristin_hunt.